Attorney Siegel never kept me in the dark about what was going on in my case. He explained things in a clear and concise way. When he said he was going to do something he got it done. Attorney Siegel really knows his stuff. He filed a lawsuit and within days it settled! ​​​​​​​The insurance company was quite arduous in their dealings with my case. Mr. Siegel was very tactful in his negotiations with the insurance adjusters & supervisors and certainly implemented an innovative approach to getting my case resolved. I can say with confidence that I do not believe many attorneys would have held up to such pressure, all while maintaining a high level of ethics and professionalism. Unbeknownst to Mr. Siegel, I did my background research on him from other lawyers in the industry and I got nothing but positive remarks from his peers. He clearly goes above and beyond what any of those TV commercial/ambulance chasers would do. His legal experience is exemplified with his understanding of insurance company processes and furthermore was able to explain it to me as a client so that I was not left in the dark. Mr. Siegel is laser focused on resolving the case in the best interest of his client and not just move on to the next one. I am sincerely grateful that I had Mr. Siegel representing me and have already recommended him to others within in my network. ​​ as my lawyer was a great experience. He was always polite, took all of my phone calls and kept me informed all the time. I was very happy with the settlement . ​​​​My case just settled and I couldn't be happier about the results. I received that maximum insurance policy limits from two insurance companies and Attorney Siegel didn't even have to start a lawsuit. He had a command of the law and found another insurance policy which I am sure most lawyers would have missed. If you want a top notch personal injury lawyer don't look any further. ​​​I had hired one of those lawyers who advertise on TV and the busses and they never gave me any personal service. They never knew the status of my case or told me what was going on with my case. They may be good at advertising but that's about it. I switched to Attorney Siegel and everything was different. He always returned my calls and knew exactly the status of my case. He kept me informed about everything. He settled my case for a very large sum much more than I expected. ​ I am very happy with the results and would recommend him highly. After meeting with David Siegel for the very first time, i knew that I would be taken care of completely. David assured me that his experience was all I needed. David is direct and focused on your needs, he talks to you and listens when you speak. Knowing that I had David working on my case allowed me relax and heal. Highly recommended. ​​​​​​​David H. Siegel walked me through each step of the legal process required to pay my medical and legal bills regarding a not "at fault" car accident that I had in 12/2011. He is a very compassionate, knowledgeable and a good listener. I recommend David H. Siegel should you get into a car accident and need legal representation to deal with the insurance payment process. ​​​​​​​​​​​​​​​​​​​​​​I was in a car accident which I was rear ended and ended up with back injuries. Atty Siegel was always there to answer any of my questions . When you called, Atty Siegel was the one that you spoke to. No middle person or delay in him getting back to you. He is honest, dependable and he cares about you as a individual person. Your not just a case for him! 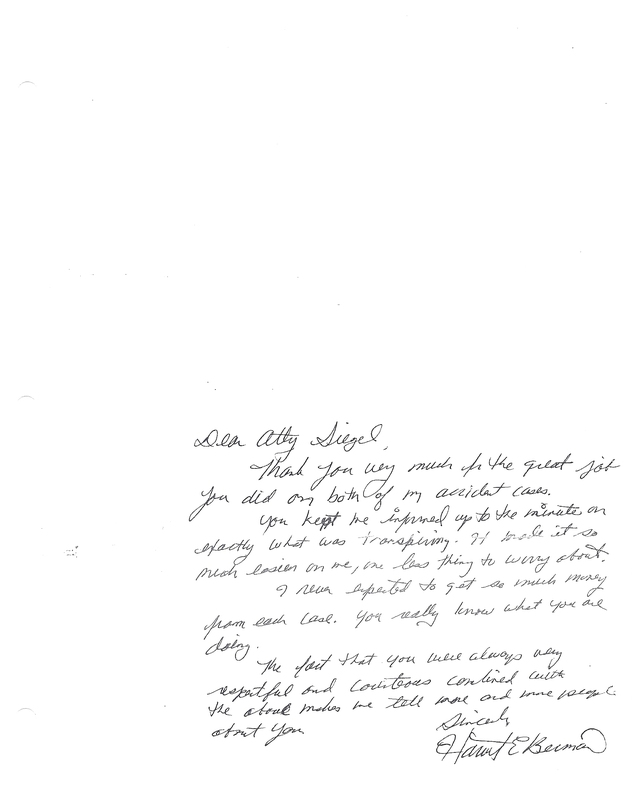 Atty Siegal helped me get the most that I could get for my settlement. Overall experience was excellent and I would highly recommend Atty David Siegel to anyone. Thank you David! ​​​​​​​​​​​​​​​​​​​​​​​​​​​​​​​​Attorney Siegel is a man of his word. He is reliable and always kept me informed. Anyone who uses him will be pleased. Great Lawyer! We went to trial and Won! Settled my case very quickly and always kept me informed and answered my questions. I even received my settlement before Christmas! 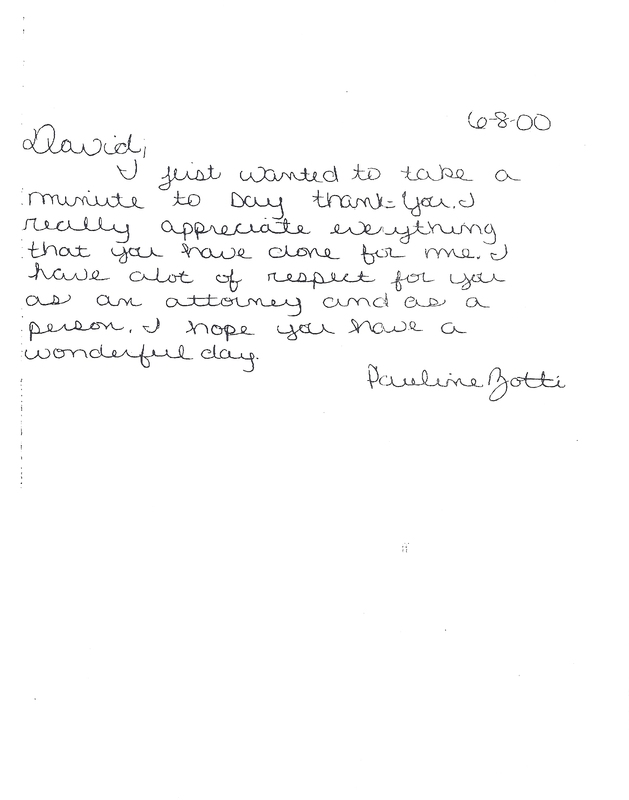 Wonderful attorney, very honest and pleasant to work with, appreciate work he did for me and great work ethic. Recommend him to anyone for their injury case! Very knowledgeable and helpful. Prompt responses and honest advice. He is an excellent lawyer who is very helpful and stays on top of things. It was a relief to hand over the case to Mr.Siegel,Maintaining his professional style he talked like a friend as he always had a time to answer my worries.Never bothered me with calls.etc.He co-operated with my busy schedules,& worked with my availibilty.He handled the case so well I am so happy he had my case. I was involved in a car accident in which my car was totaled and the other person in the other car was killed. Attorney Siegel took care of everything for me. 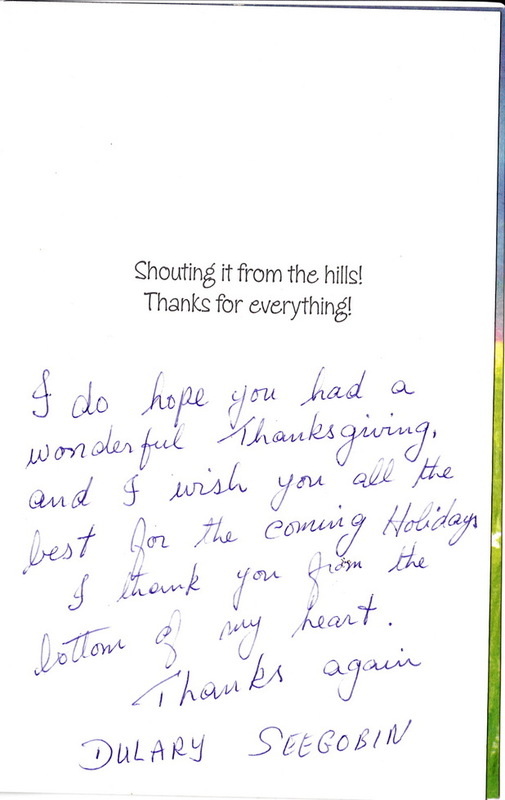 I really appreciate what he did for me and got me a very good settlement. God bless him and the doctors who took care of me. of humor and is truly a people person. 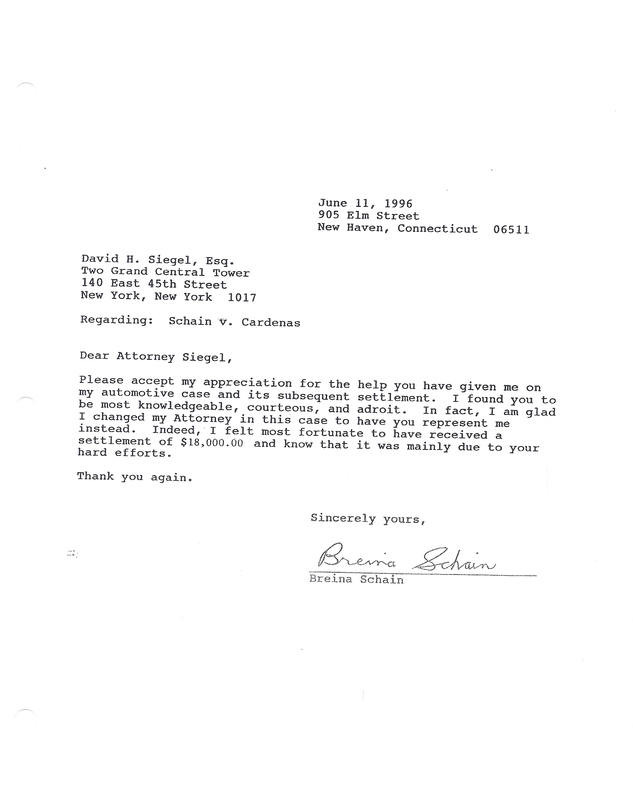 Attorney Siegel always kept me aware of my different options and kept informed on the status of my case. He made us feel comfortable with the making decisions. This was our first time dealing with this type of situation and he handled it very professionally and timely. We would definitely recommend his services to anyone in need. Was very quick, and informative with our different options. We were recommended by a family member and he kept us informed all the way. Great, hard-working attorney! He did a very good job and answered all my questions. Got my settlement in a short period. Overall excellent Job . Would recommend him! anybody who wants a lawyer who can fight and win. Lawyer David is very good with his work,I met with an accident he helped me and in the end I did get what I had to! I would recommend him to everyone! I would definitely recommend Mr. Siegel to anyone who has been injured. He got me everything that i deserved and moved through my case very quickly EXCELLENT!!! What can I say. He's very reliable and trustworthy. 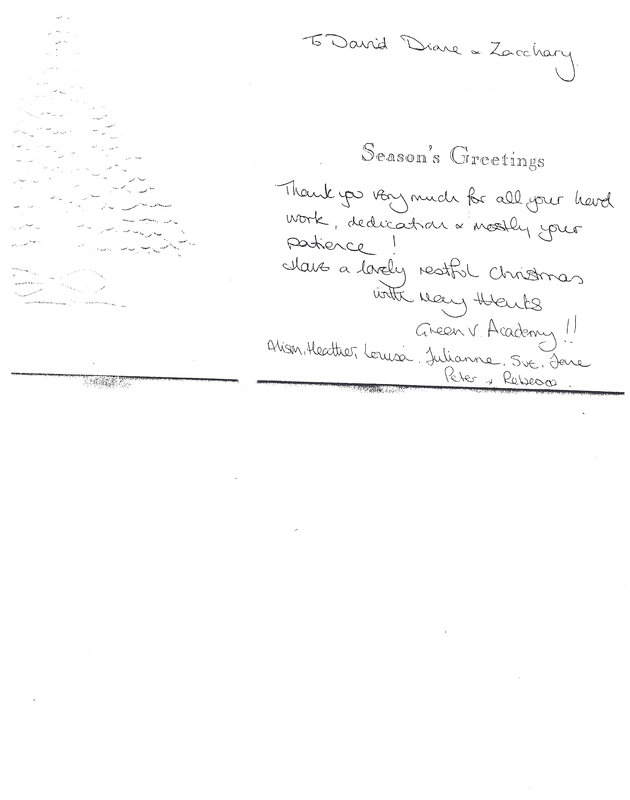 I've been working with him since 2006 and I am nothing other than pleased with his prompt service. Also, Attorney Siegel knows his stuff. So if you want a decent amount of change in your pocket, retain him because he's "The MAN." I would recommend Atty Siegel to anyone without any second thoughts. An attorney who cares about his clients. He always does the best for his clients. And kept us informed all the time. Pleasant at all times. He became a friend to us.Out of all the lawyers we used in the past he is the best one! Good Service. Very good response to phone calls. Kept me informed about the case and answered all my questions. Upfront about the case and its outcome. Satisfied with the compensation I received. ​​​I feel good about what Attorney Siegel did for me. He worked very hard for me and kept me informed about the case. He was very knowledgeable about the law and was able to get the insurance company to settle the case at very good amount. It was more than I thought he would obtain. I would highly recommend him. 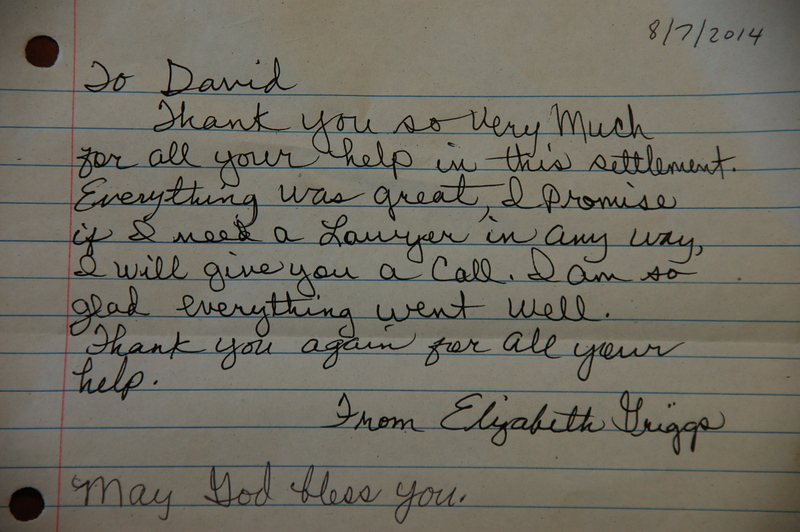 David was very well prepared with all aspects of the process and the legalities of the state. I can't say enough about him, he very prepared during the mediation and throughout the case. I received so much more than i could have imagined. If you want an attorney that truly cares and will work hard for you, i highly suggest you call him! ​​​​​I hired Attorney Siegel after I was injured in an automobile accident. His demeanor was pleasant and professional. He quickly assessed my case and how he could help me and he was able to successfully reach a settlement for me within 10 months of the accident. The settlement amount was more than I thought I would recover. ​​​​Attorney Siegel had to file a lawsuit not only against the person who hit me but also against my own insurance company. As a result we received the maximum amount of the policy from the person who hit me insurance and an unexpected large amount from my own company. He settled against both insurance companies very quickly. ​​We had a difficult case which involved multiple states. Attorney Siegel was able to navigate his way through the laws of these states. He also dealt with medical liens imposed by these states. This was my first accident and there is no way I could have handled this on my own. ​​Impressed with knowledge and very understanding and calm and called me when I needed him. Very honest attorney. Gathered facts and used his experience to negotiate a great settlement. Always available and responded to my questions. Started to work on my case immediately. Rectified a problem in that I did not go to a doctor for one month after the accident but still got a maximum settlement. We met with insurance adjuster and she paid double her previous offer. Very knowledgable. Contacted the right people to get the job done. Great communication between us. Always returned my calls. Very satisfied with settlement. He got me the full amount of the policy from the guy who hit me and then a great deal more compensation from my own insurance company. David Siegel is very professional, quick, and efficient on how he handles cases. 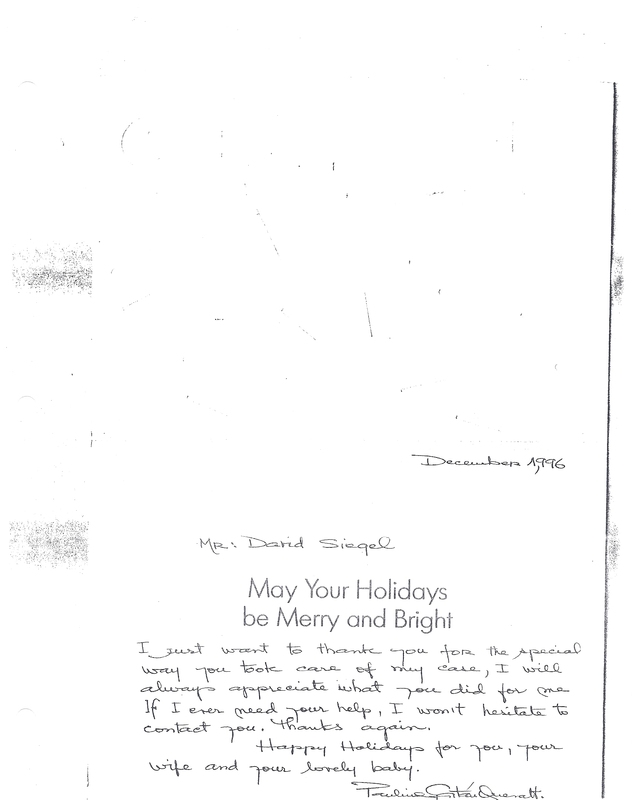 He was more than helpful and I would highly reccomend David Siegel to friends and family. Very detail oriented which I am sure resulted in my large settlement. He always returned my calls and answered all my questions. We obtained settlements from the driver who hit me and my own insurance company as well! I will definitely send my family and friends to him. ​​​​​​​​​​​Attorney Siegel is the BEST injury attorney. He handle my case quickly and recieved a settlement that was far more than I thought I would get. Highly recommended!